"Manhood. It's the only badge that matters." 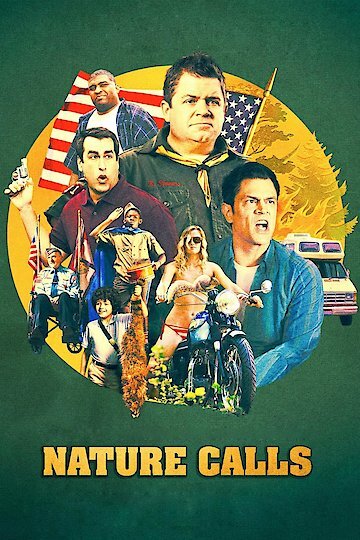 Nature Calls is a comedy film that was released in 2012. The film involves two brothers who are completely unlike each other, and seem to be constantly engaged in conflict. Things get worse when one of the brothers decides to take command of the other brother’s sleepover. This results going out on a scout trip, and they end up having one of the biggest adventures of their lives. The brothers also have to work together in order to make it through the scout trip. Nature Calls was written and directed by Todd Rohal. The film feature Patton Oswalt, Johnny Knoxville, and Rob Riggle. Nature Calls is currently available to watch free on Tubi TV and stream, download, buy on demand at Amazon, Vudu, Google Play, iTunes, YouTube VOD online.